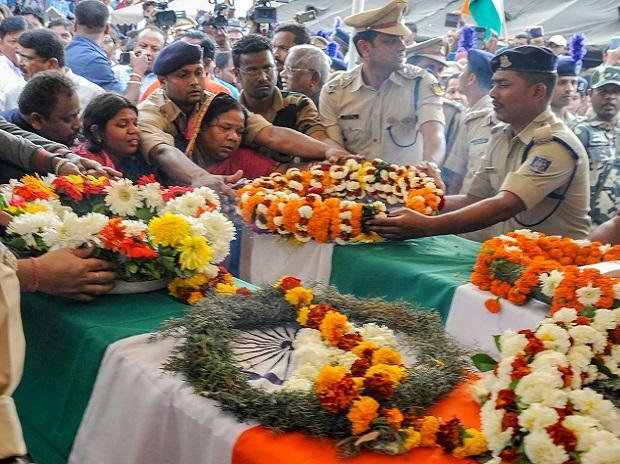 India is in mourning after more than 40 CRPF troopers were killed in a suicide attack. In the biggest terrorist attack in 30 years in the state of Jammu and Kashmir, a car laden with 350 kilograms of explosive rammed into a convoy of 78 vehicles. The bus it hit directly was converted into a heap of twisted metal with not a single occupant left alive. News reports say that the blast was so powerful could be heard 10 kms away. The shock it delivered continues to reverberate even now. Pakistan based terrorist group, Jaish-e-Mohammed has taken responsibility for the attack and India has moved to try and isolate Pakistan internationally. The attack has once again brought into focus, Jaish-e-Mohammed and its chief Masood Azhar. 19 years ago India had released him from a prison in exchange of lives held hostage in an Indian Airlines’ flight in Kandahar. India has tried to get Azhar designated as a global terrorist but those efforts have been blocked by China. Now, as bodies of the slain soldiers reach their villages and towns; as the initial horror gives way to anger, questions will be asked about why this happened and what India’s response will be. Yesterday, the Prime Minister informed that the security forces had been given complete freedom and those behind this attack will be made to pay and the opposition parties announced that they stood right behind the security forces and the government in this hour of grief. Even as the country was grappling with this loss, we began hearing chants for revenge on television and social media. Some tv news anchors did shows on what India must do while others tweeted with #EndPakistan hashtag, a kind of Indian tv version of the Maori war dance. At the same time, others wanted to understand why the suicide bomber became a terrorist in the first place. The attack raises uncomfortable questions about a suitable response from the Indian state. The response has been complicated even more because of a raised rhetorical pitch over the last few years and the present government’s carefully cultivated macho image. Just a day before the attack in Pulwama, the Minister of State for Home, Kiren Rijiju patted his own government’s back for ‘no major terror attack in last 4.5 years’ except Uri. The surgical strikes after Uri were used as an electoral asset with the prime minister, his party’s president and various ministers using it in their election speeches to underline their ‘tough’ and ‘uncompromising’ stance when it came to Pakistan and national security. Last month, Uri, a film based on these surgical strikes became a massive hit, raking in Rs 200 crore at the box-office. In the film, actor and BJP MP, Paresh Rawal, playing the character of National Security Advisor, Ajit Doval says, “Ye naya Hindustan ghar mein ghusega bhi aur marega bhi” (this new India will barge into your home and hit you as well). Surgical strikes after Uri have been a major component of BJP’s national security image projection. Even the Prime Minister could be heard asking film personalities “how’s the josh?” (a dialogue from the film Uri) in a meeting in January. Throughout its tenure, the BJP government has tried to portray itself as uncompromising in the face of any challenge to national security, whether internal or external. This projection has been accompanied by a portrayal of other political parties as weak when it comes to issues of national security, with their patriotism being questioned directly by members of the party in power and by news channels who can be said to be veering towards the BJP. This is par for the course when it comes to politics but becomes a bit burdensome when it comes to actual governance in the event of a terror attack, like the one in Pulwama. Any question on national security that has been asked of the Modi government has so far been answered by waving the testimonial on its ‘tough stance’ thanks to the surgical strike in 2016. By using it as a kind of a shut-up call, the government has so far avoided serious questions about India’s security situation. With the attack in Pulwama, this armour may have been penetrated. The surgical strike after the terrorist attack in Uri was an escalation of hostilities from India. How will India respond to the Pulwama attack now? What will be the political call that the government will take? The prime minister has said that the security forces have a free hand and the opposition parties have said they back the forces and the government. Now, the government at the centre needs to decide what the Indian response will be and this has to be a political decision of the government, rather than be left to the security forces. Having raised the levels of jingoism in national discourse over the last few years, the government may find its options limited. No action and its ‘tough’ image will take a beating and do something escalatory and India may not be able to control what happens afterwards. India has faced such tough questions in the past as well. It happened when the Indian parliament was attacked by JeM and Lashkar-e-Taiba terrorists in 2001. India responded by deploying its armed forces on the border. India and Pakistan were locked in an eyeball-to-eyeball confrontation but did not go to war. India faced the same dilemma once again when its financial capital, Mumbai was attacked by Pakistani terrorists in November, 2008. Former National Security Advisor, Shivshankar Menon (who was India’s Foreign Secretary then) explained in his book, Choices - The Making of India’s Foreign Policy (2016), that he himself pressed for immediate military response to this major attack. He wrote that even though some people in the government wanted a military response, the Indian government chose not to attack Pakistan. Its response, he wrote, was determined by what it saw as its own national interest at that time. The Vajpayee government in 2001 and the Manmohan Singh government in 2008 were able to make a choice. They were able to do it despite huge public pressure as neither government had boxed itself in through its words or deeds during its tenure. This is not to argue that India shouldn’t undertake a military response now. Forty soldiers have died and retribution for such an attack is perhaps called for. The government of the day must study all available factors, pick the most suitable response and then undertake it at the time it is most beneficial for India. But through its own utterances and projection, the Modi government may have foreclosed certain options; options which may not deliver a televised spectacle but may be as legitimate as and more optimal than a surgical strike. Within hours of the Pulwama attack, tv news picked easy targets to vilify. As anchors questioned everyone from university students, opposition parties, their leaders, and media figures, we are once again hurtling down a path where we have little control over our responses. This narrative aids the party in power and helps it avoid accountability as well. While political opposition has refused to ask any difficult questions in the immediate aftermath of this attack, such questions will surface eventually and must not be pushed aside using jingoistic tropes. There are questions about diplomatic failures, like the inability to persuade China and get Masood Azhar’s designated as a global terrorist. There are questions about operational failures, like how this attack took place despite warnings of a ‘Syria-style car bomber’ attack in advance. There are questions about political accountability regarding the situation in Kashmir, where the byelection to the Srinagar Lok Sabha constituency in 2017 saw a voter turnout of 7 per cent, down from 25 per cent in 2014. These questions can perhaps wait a few days, but it is an inescapable truth that jingoism and talk of war limit our options. Any military option exercised by the government must not be only about taking revenge but also about compelling Pakistan to alter its behaviour. That, and not the hashtags put out by TV anchors, has to be yardstick for any choice made by the government.